Repairs and adjustments to your electric or acoustic guitar or bass. Refretting your fingerboard or recrowning your frets. 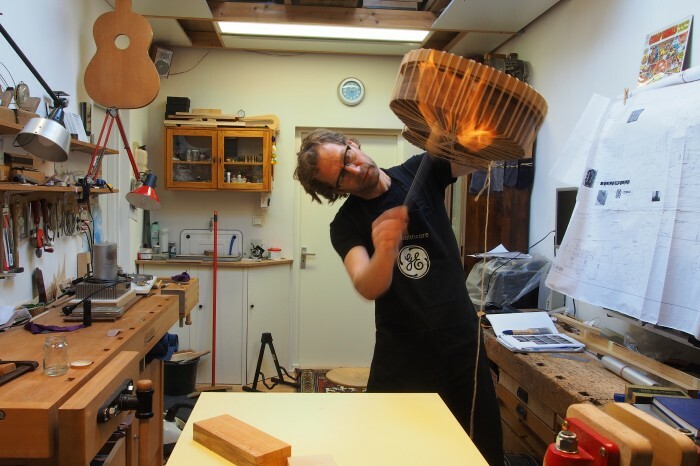 Historically sound repairs on every string instrument. Handwound pickups and repair or rewounds of defective pickups. Special handmade tools for the luthier. My mission: To enable musicians to explore and express their creativity by providing them with first class (custom built) Instruments. In 2014 I was awarded the golden fingerplane for promising Talent of the CMB in Belgium. in 2018 I won the third Prize in the Antonio Marin International Guitar building competition in Granada. The coming decade my focus will be on the Classical guitar in terms of guitar building. I also participate in the Leonardo Guitar Project. In 2014 I built a guitar in Beech for the first phase of the project. In May 2015 I was able to work in Italy for a month with Lorenzo Frignani on the project. December 2016 I have finished 2 guitars for the second phase of this Leonardo Guitar Project. They were presented at the Cordefactum festival 2017. Another project was the building of 2 Manuel Ramirez 1910 Models, one with and one without Tornavoz. The Manuel Ramirez without Tornavoz was finished in 2017. The Model with Tornavoz was finished june 2018. A project for 2019 is building two Santos Hernandez models, one in spruce, one in ceder. For news and other projects take a look at my facebook page.